Digiscoping is the ingenious practice of connecting a digital camera to a spotting scope for close-up shots of birds and other wildlife. What began as a bit of a "hack" by serious birders has become adopted by Nikon and other optical companies. Nikon just announced their Digiscope 8.1 package to complement their existing 5.1 and 7.1 Pro Digiscopes. 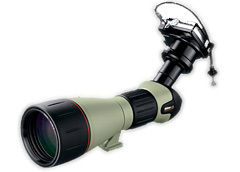 The package includes a spotting scope, eye piece, bracket, and Nikon camera (as shown in the picture). Prices start around $730 USD. You can cobble together your own system too. I featured digiscoping in my Digital Photography Hacks book (Hack #94 "Get Close with Digiscoping"). If you don't have the book yet, I have a treat. You can download a PDF of the digiscoping hack (1.3 MB) and build your own system. This hack was contributed to the book by Terrie Miller and is in its original printer's proof format with all of the alignment marks. Regardless if you build your own system, or buy a slick one such as Nikon's offering, digiscoping is a great way to capture some of Spring's magic. That new Nikon system looks really sweet!